Back in May 2015, Playtonic Games revealed their latest game: Yooka-Laylee. The game was being billed as the spiritual successor to Rare’s Banjo-Kazooie. How could Playtonic attempt to take over from Rare? Well, it helps that Playtonic is made up of a group of several former key Rare employees, employees that just so happened to create Banjo-Kazooie during the Nintendo 64 era. 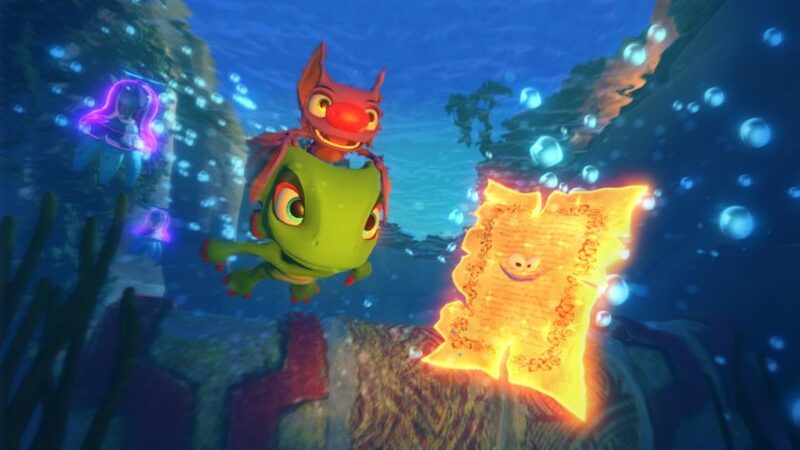 Sporting a bright, colorful world as well as a wacky duo in Yooka (a male chameleon) and Laylee (a female bat), Yooka-Laylee looks like the type of game we’ve been sorely lacking for some time. If you’ve been craving a 3D platformer, there aren’t many developers who will be able to make a better game than the veterans behind Donkey Kong Country and Banjo-Kazooie. As I mentioned earlier, you play as Yooka and Laylee in this large open-world platformer. Your goal is to stop the main villain, Capital B (literally a Bee in a business suit), from stealing the world’s supply of books in order to make money from them. Throughout the duo’s journey, you will encounter a number of unique characters, just like Capital B, and worlds such as Tribalstack Tropics and Glitterglaze Glacier. In order to access these worlds, players will need to collect Pagies (pages from a magical book that Capital B stole at the beginning of the game). These Pagies can be used to either expand the world you are playing in or open up a brand new world entirely. Yooka-Laylee feels just like Banjo-Kazooie, and that’s not necessarily a good thing regarding some aspects of the game. Right from the beginning, I was put off by the way dialog is handled in Yooka-Laylee. Conversations take place using text bubbles and gibberish voices, just like the original Banjo-Kazooie. I mean, I know the developers are going for that classic Banjo style, but it’s 2017! I’m sure Rare fans will appreciate details like this, but as someone who isn’t nostalgic for the original game, it just seems dated at this point. The characters in Yooka-Laylee look like they were taken directly from a cartoon; it’s a shame they don’t have the voice actors that would typically accompany them. Speaking of the audio, Yooka-Laylee also boasts a soundtrack composed by David Wise (Donkey Kong Country) and Grant Kirkhope (Banjo-Kazooie). The cheery music combined with the vibrant world of Yooka-Laylee made me feel like a kid again. I was reminded of a time where you’d only have one game to play so you needed to make it count. Yooka-Laylee takes the classic approach to collectible items in games, littering masses of Pagies, Quills, Ghosts and more around the world. Players will always find something to do in Yooka-Laylee as the game keeps track of all the items you’ve picked up, as well as letting you know just how many you’ve missed out on. The collectible items aspect of Yooka-Laylee will shine on a console/handheld like the Nintendo Switch. 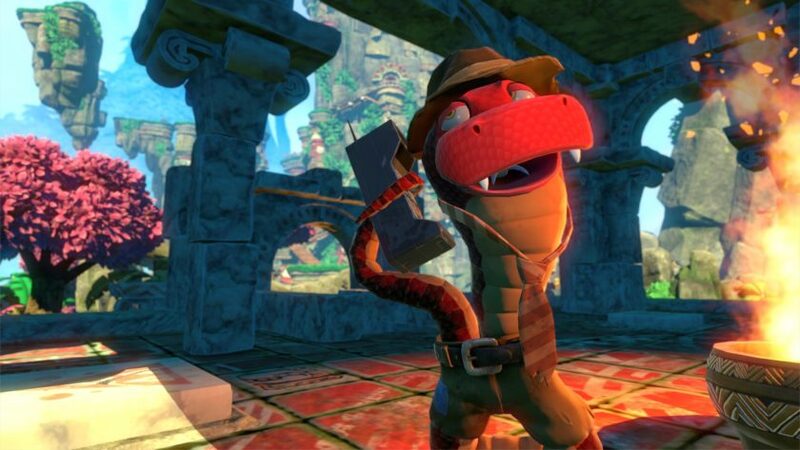 There aren’t many details available about the Switch port of the game right now, with Steve Mayles, the Character Art Director at Playtonic remaining tight-lipped on the topic during our interview. Yooka-Laylee is the type of game you could easily pick up and play for a short period of time, making it perfect for a handheld experience. 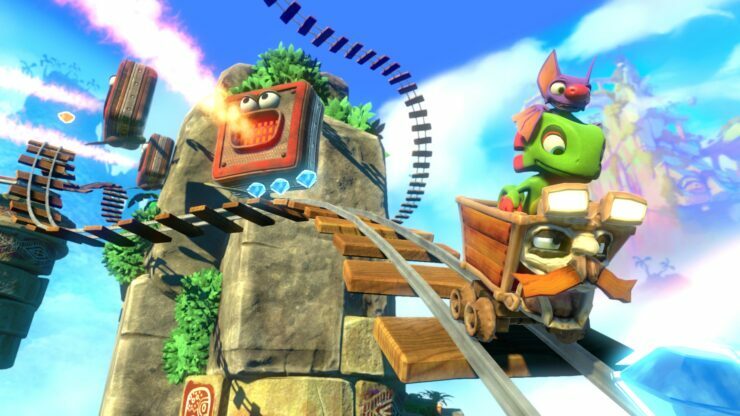 Playtonic wants the player’s choice to be a key factor in how the game is played. As a result, it is up to the player whether or not they decide to explore a new world or expand an old one. There is also the decision to invest your Quills (the game’s currency) in special moves for Yooka and Laylee. At the moment, I’m not entirely sure what else you can spend your Quills on, but there must be something. The folks at Playtonic see these options as prioritizing the player’s choice, however it doesn’t make much sense to me. I expanded the first world (Tribalshack Tropics) instead of opening up a brand new area. Tribalshack Tropics stretched out to include a huge tower, along with a mine cart ride and a little cameo by Yacht Club Games’ Shovel Knight. As I proceeded to enter the newly formed tower, I was stopped by a CCTV camera that would not let me pass through a gate. Presumably there are abilities you acquire later on in the game that allow you to progress past this point; but why am I given the option to expand the area only to be locked off from some of the content? Quills are used to purchase special moves which will then allow you to complete missions you couldn’t otherwise do. Why should the player have to find an NPC in order to purchase special moves instead of being rewarded for collecting a certain amount? It seems like the developers are intent on having the player backtrack for almost no reason. Early on in the game, this decision is even more redundant as you can’t spend your Quills on anything else, so the currency’s only real purpose is to artificially lengthen the game. The preview event I attended had the game running on a regular PlayStation 4. Yooka-Laylee ran at a solid 30fps, though I must say I was disappointed not to see it running at 60fps. I know the PC build of the game runs at 60fps, so if that sort of thing matters to you then you may want to avoid the console version. In addition to this, Playtonic’s Steve Mayles stated in our chat that a PlayStation 4 Pro patch for 4K or 1080p 60fps is not currently in the works. I came away from Yooka-Laylee thinking Playtonic has done a great job recreating a Nintendo 64 game in 2017. Unfortunately, this comes with all the negative points of creating an older game in present times. Yooka-Laylee wouldn’t feel out of place running on a Nintendo 64 (aside from the nice visuals), and for some people that probably isn’t a bad thing. This game is the closest thing you will get to a Banjo-Kazooie sequel; I’m sure fans of the original Banjo games will not be disappointed. Yooka-Laylee will be available worldwide on April 11th for PC, PlayStation 4 and Xbox One. There will be a Switch port of the game coming at a later date, so stay tuned for coverage on that.